Line of credit of up to $5000. Repayments really might be lower than you think! We’ve made borrowing simpler, faster and cheaper. *A Nimble Small Loan is a small amount credit contract. 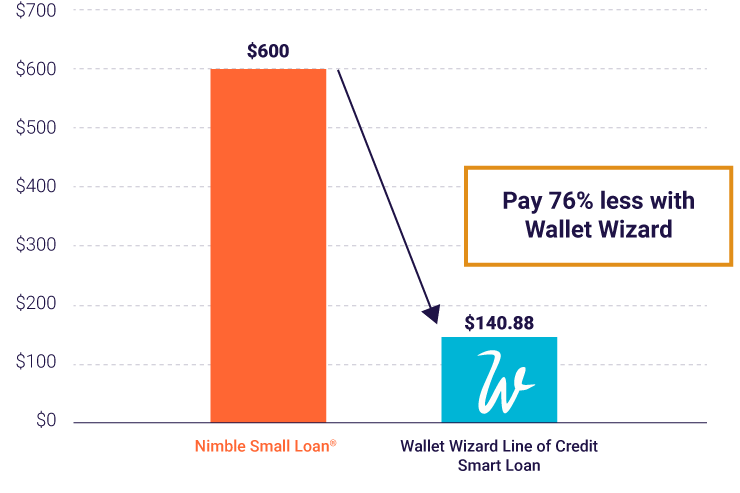 Our Smart Loan is a continuing credit contract. The comparison is true only for the example given and assumes no default. A comparison based on different loan terms, fees, loan amounts, and other lenders may produce a different result. The comparison was made with data available at www.nimble.com.au on 25 February 2019. Forget nasty surprises. Unexpected fees are no fun. But Wallet Wizard members don’t need to worry about a thing. We state all fees up-front so you can rest easy.